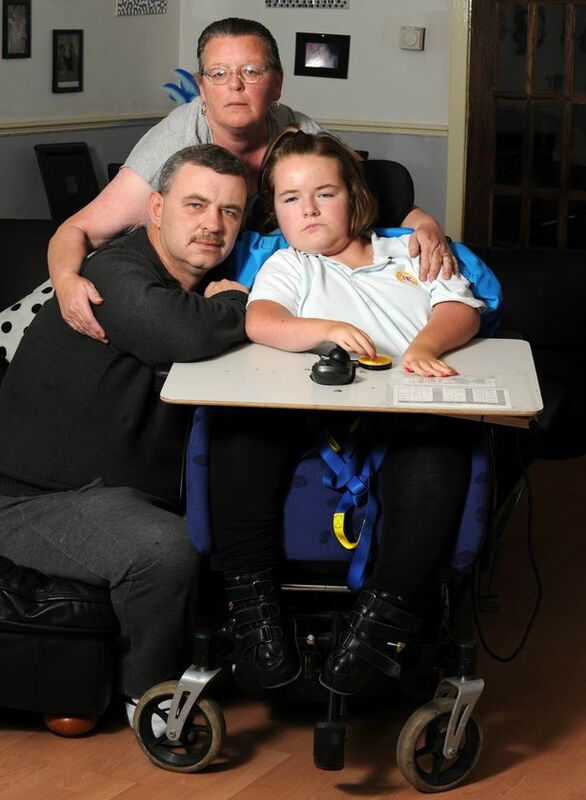 THE parents of a severely disabled schoolgirl have had precious respite care axed – because their daughter can talk. Elizabeth Ferguson can barely move from the neck down and she needs constant care. She is looked after round the clock by mum Lorraine and dad Gary. And the only time they get a break is when a care worker comes to the house for four hours once a week. But doctors who assessed Elizabeth, 14, say her family are no longer entitled to respite care. They based their decision on the fact that the teenager is able to say when she needs to go to the toilet and therefore she cannot be classed as incontinent. Gary, 43, said: “We couldn’t believe it when we were told the service was being withdrawn. “Elizabeth has a review every six months and this time we were told she hadn’t scored enough points to be awarded the service because she is able to speak to us and tell us if she needs the toilet. Elizabeth has Arthrogryposis Multiplex Congenita (AMC), a rare congenital disorder that affects the joints and severely restricts her range of motion. For the past two years, a care worker has visited the family every Wednesday to give Lorraine and Gary a vital chance to re-charge their batteries. But while Prime Minister David Cameron makes promises to do more for those who care for loved ones, the Ferguson family have been told they don’t deserve a break. Last week, the couple received a letter saying the iCare service, which provides community respite for carers of children with complex needs, was being withdrawn. The service costs about £60 a week. Gary, from Easterhouse, Glasgow, said: “I think it is really terrible what they are doing to us. “The four hours a week is the only break Lorraine gets from looking after Elizabeth. “She can’t just get up and leave any time she wants to. “Elizabeth is upset too because the carer who has been coming to our house every week for the last two years has built up a fantastic relationship with her. Gary said Elizabeth’s condition has not changed in the two years since the family have been receiving respite care. So he cannot understand why it has suddenly been withdrawn. The family contacted the NHS but they claim bosses weren’t sympathetic to their plight. Citizens Advice have written to NHS Greater Glasgow and Clyde on behalf of the family, asking for the decision to be reversed. A spokeswoman for the health board, who provide the iCare service, said: “This little girl was assessed and is provided with a full support package which meets all her needs. “We can confirm we have received a complaint from her parents regarding respite care. The decision flies in the face of comments made by Cameron, who said more should be done for the army of carers who look after disabled and sick loved ones. The current Carer’s Allowance paid to people who look after loved ones is just £58.45 a week.